Here we have it folks. The cookies of your dreams. The cookies that have been missing from your lives. Cookies that will make you go a little crazy. Cookies with a secret ingredient that you already know about because it’s in the title of this post 😛 . May I present: Chewy vegan tahini chocolate chip cookies. Well, I say chocolate chip, but really we’re talking dark chocolate chunks. A bar of good quality dark chocolate, chopped up and mixed into the cookie dough for pools of rich, melty chocolate. 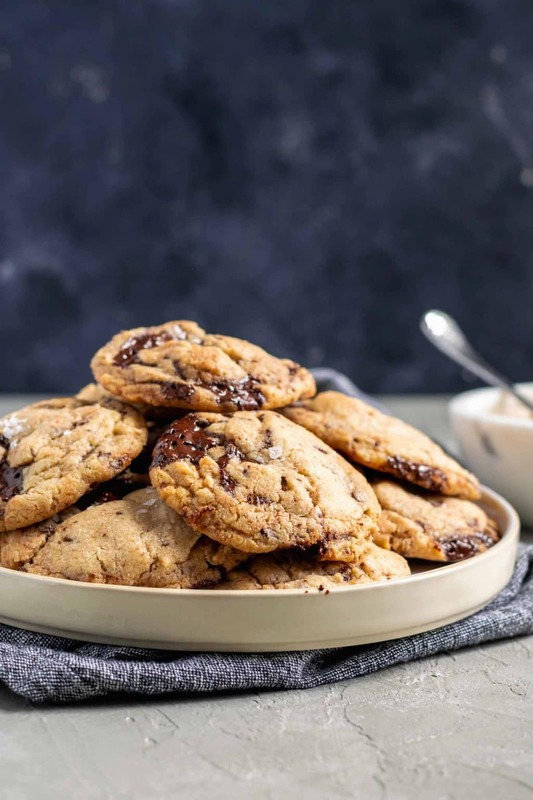 The tahini-laced cookies have a delicious nutty and caramel-y flavor which pairs perfectly with slightly bitter dark chocolate. Topped with flakes of sea salt, each bite of cookie is like a morsel from heaven. 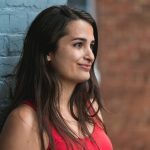 I first started craving tahini chocolate chip cookies when I ordered a cookie at a local plant based Israeli restaurant (for anyone in or visiting DC, I’m talking about Shouk). It was just labeled as a chocolate chip cookie, but it tasted a little something extra and I wondered if there was tahini in the cookie. Whatever those cookies were, I couldn’t get the idea of a tahini chocolate chip cookie out of my head. 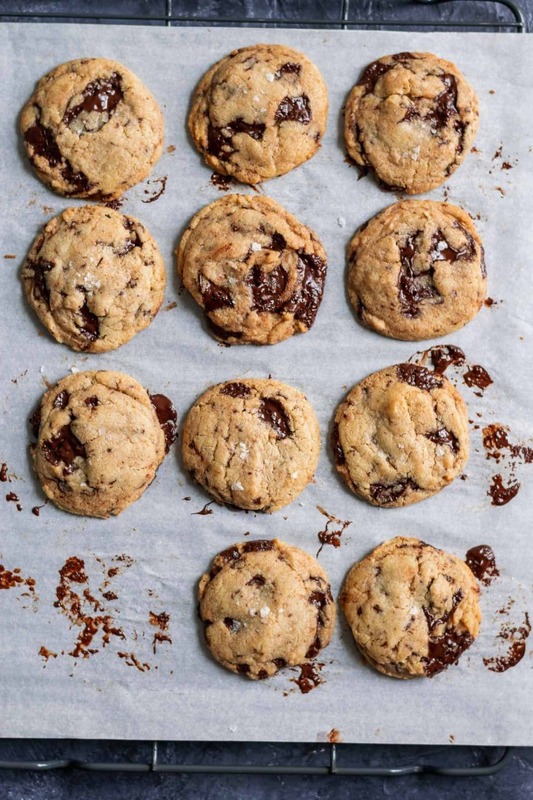 So I did a little internet search, and discovered tahini chocolate chip cookies were kind of a big deal, like, a year or two ago, thanks to Danielle Oron and her book Modern Israeli Cooking. Her recipe reminded me a little of the base for my vegan chocolate chip marshmallow cookies, minus the tahini of course. Possibly just in the sense that all cookie recipes are a bit similar, but nevertheless, I was pretty sure that combining the two recipes would create something magical. I wanted a chewy cookie with deep caramel notes, so the first thing I did was to use a mix of granulated sugar and brown sugar. Brown sugar creates a chewier cookie, and thanks to the molasses added back into the processed sugar, it has a much richer flavor. Brown sugar also spreads less than white sugar in a cookie, which is something that vegan cookies can struggle with as there is no egg protein to set and hold them in. To replace the butter I substituted refined coconut oil. I’ll admit that coconut oil can be rather finicky in baking as it’s very temperature sensitive. It’s melting point is about 76 ºF which is room temperature. For me, that means in the winter I will have solid coconut oil and in the summer it’s typically liquid. And occasionally it’s at that perfect state: solid yet soft and scoop-able. When coconut oil is in this desirable creamy state, it’s perfect for making cookie dough. But with a few tweaks in this recipe, even ultra soft solid or liquid coconut oil works. While vegan butter, such as Earth Balance Buttery Sticks, would have worked well in this recipe, not everyone has access to or likes to buy vegan butter, so I wanted to make a coconut oil cookie even if this meant extra recipe testing! I used refined coconut oil because it is de-odorized and does not taste coconutty and compete with the tahini. But, unrefined coconut oil would work fine too if that’s what you prefer! Eggs are easy to replace in cookies, compared to cakes or other baked goods. Often just adding a couple tablespoons of plant milk per egg is enough to compensate for the liquid. With these cookies they needed a little extra help, so I added some corn starch (tapioca starch, arrowroot powder, or potato starch should also work). Starch helps the cookies bind, so they don’t spread too much. This is important with coconut oil-based cookies, as they are prone to spreading a lot in the oven, as coconut oil liquidizes quickly in the hot oven. Cornstarch also makes for a chewier cookie, which was what I envisioned for these tahini chocolate chip cookies. As an aside for the food geeks: I did test a version of the cookies with a flax egg (this is simply ground flax mixed with the liquid and left to sit until it forms a gloopy egg-like texture). That batch created a thinner cookie, but the cookies varied a lot within the batch, with some of them spreading a lot more than others and getting lacy edges. They were also less structurally sound and easily fell apart. Tahini is an important part of this recipe, with a 1:1 ratio of coconut oil and tahini. It does more than add flavor to the cookie base, but also softens the cookies and helps keep a nice chewy texture. 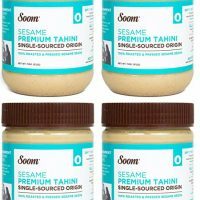 Now, those of you who like to cook with tahini (me too) are aware that the consistency of tahini varies a lot between brands. Sometimes it is very thin, and sometimes it’s thicker and more comparable to a runny nut butter. Your cookies will spread a little more or less depending on how thick your tahini is. I tested the recipe with both Soom tahini which is on the thinner side and Woodstock tahini which was on the thicker side and I enjoyed the cookies both ways. That being said, if you make a batch of these cookies and find it spreads more than you’d like, add a tablespoon of flour to the next batch (and trust me, there will be a next batch). Or if you find the cookies don’t spread enough, remove a tablespoon of flour next time. Or just be happy and eat your delicious cookies already! The last thing to consider with these cookies is what chocolate to use. And while you can use chocolate chips, I chose to use bars of dark chocolate. 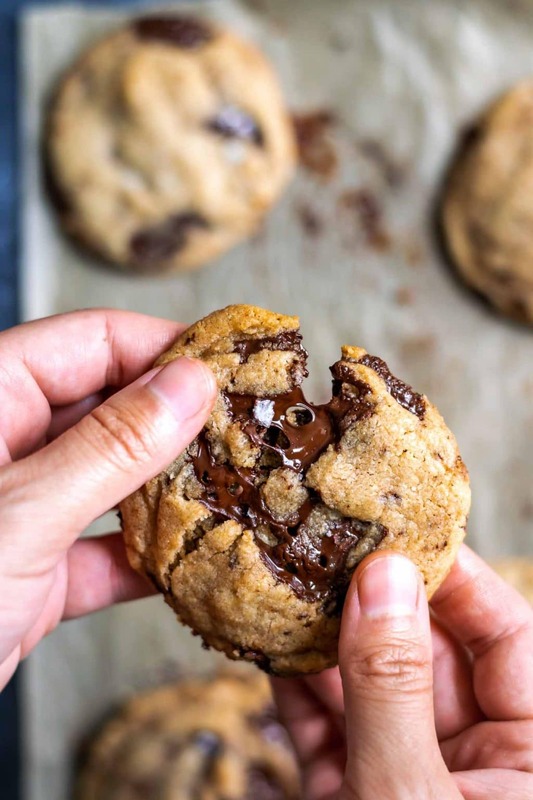 I love the uneven pieces and sizes of chocolate you get in your dough from chopping up chocolate: from small shavings that just melt into the cookie to large chunks which create beautiful dark puddles. Unlike chocolate chips, which hold their shape during baking, dark chocolate melts in the oven and remains soft and melty until fully cooled and even chilled a bit. Choose a dark chocolate between 60 and 70% that you enjoy eating. If you love super dark and more bitter chocolate go for a higher percentage, while if you like milder and sweeter chocolate go for a lower percentage. I’m happiest somewhere in the middle, about 65% dark. 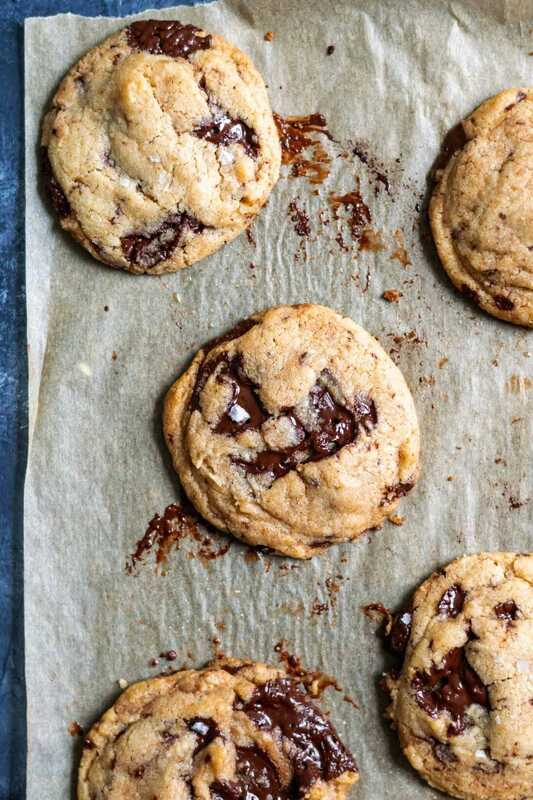 A little flaked salt finishes these cookies to perfection. I think we all know by now how perfect salted chocolate is, and salted chocolate and tahini is an even better combination. Plus, it’s so pretty and makes for a lovely presentation! I baked about 6 dozen of these cookies while testing this recipe, which means I shared a ton of cookies, both with friends and with Omar’s co-workers. And you guys, people went crazy for them! And I really can’t blame them. I mean.. just wait until you try them! 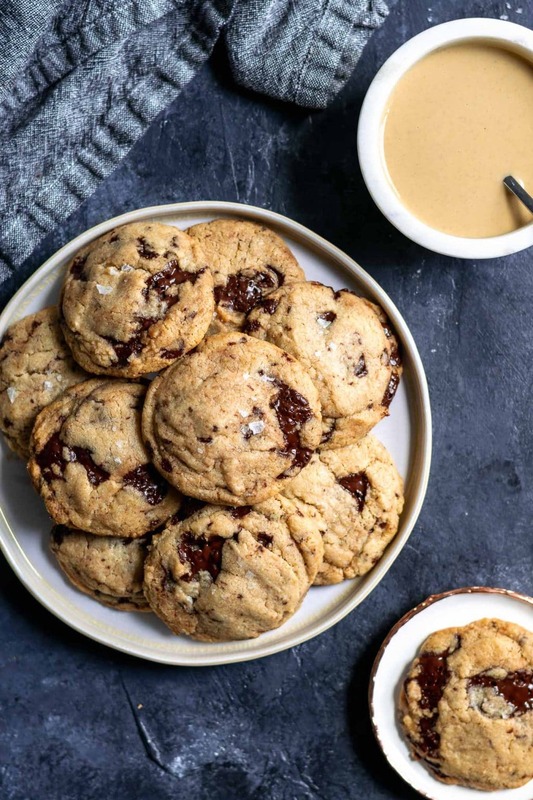 Let me know if you try making these chewy vegan tahini chocolate chip cookies! Seriously, what are you waiting for? Make these easy cookies, pour yourself a glass of your favorite plant milk, and enjoy! I mean, talk about your wild night 😉 ! Don’t forget to tag your recreations @thecuriouschickpea and #thecuriouschickpea on Instagram! I love seeing photos! How much your cookies spread during baking in part depends on the consistency of your tahini. Thinner tahini results in a thinner cookie while thicker tahini will result in the medium thick cookie you see here. If your first batch is too thin, try adding an extra 1-2 tbsp of flour to the next batch to thicken, or if the cookies are thicker than you’d like, add 1-2 tbsp less of flour. I love the ease of using my stand mixer to make these cookies (yay hands free! ), but also have made these cookies by hand using nothing fancier than a wooden spoon. It works well, just requires a little more physical effort that way! If not weighing your ingredients, when measuring the flour first whisk it, then scoop and level to measure. 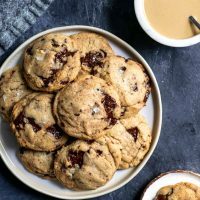 These chewy vegan tahini chocolate chip cookies are laced with chunks of dark chocolate that melt into dreamy puddles in the oven. Sesame paste adds a nice nuttiness, and deepens the bittersweet flavors of the dark chocolate. They're bound to become your new favorite cookie! Using an electric mixer, beat the coconut oil, tahini, granulated sugar, and brown sugar on medium for about 3 minutes until a smooth and creamy mixture is formed. Add the plant milk and the vanilla extract and mix another minute to combine. This can also be done with a wooden spoon, but will take more effort to cream. In a separate mixing bowl whisk together the flour, cornstarch, salt, baking powder, and baking soda to combine. Add the dry ingredients to the creamed oil and sugar mixture and mix on low speed until just incorporated. Fold in the chopped chocolate. Put the cookie dough in the fridge for at least 30 minutes while you preheat the oven, or leave in the fridge to bake the next day. Transfer to the freezer for longer storage of the cookie dough (pre-scoop the dough into balls and bake straight from frozen, and may need to add a couple of minutes onto the baking time). Preheat the oven to 350 ºF with one rack in the center of the oven. Line two baking trays with parchment paper or a silicon mat. Scoop the cookie dough into 2 tbsp (1oz) portions, a cookie scoop makes quick work of this. Place the cookie dough balls on the baking trays 3" apart. Bake the cookies, one sheet at a time, for 12-13 minutes, or until the edges are just barely golden and the center is a shade lighter. Remove from oven and immediately sprinkle some flaked salt on top of the cookies. Let cool on the baking tray. Bake the remaining cookies the same way. 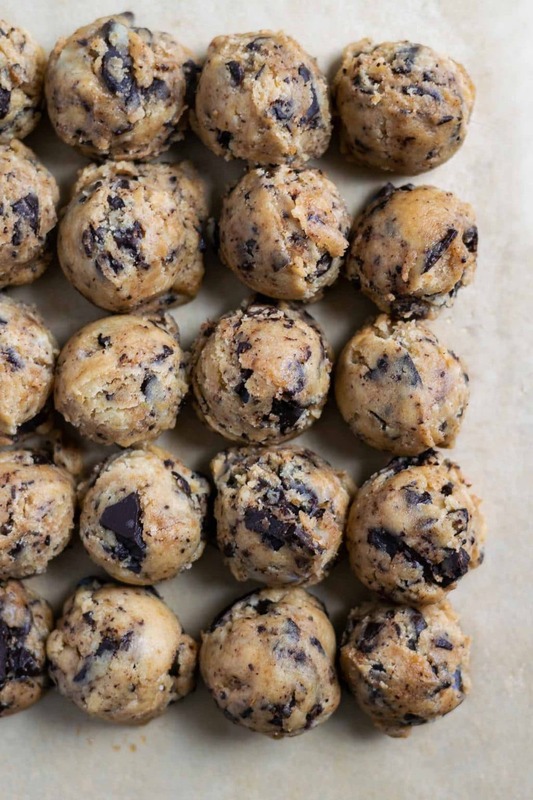 *prep time includes 30 minutes to chill the cookie dough. I just made these with a few little changes and they turned out absolutely delicious! Such a great recipe! Thanks! May I please ask which type of plant based milk that you used in this recipe? Hi Kia! I’ve made these cookies with soy milk and oat milk. Almond or cashew would also work nicely. The only plant milk I don’t find to always be the best all purpose milk is rice milk, but for these cookies any should do! Hope that helps. Great recipe, just making the second batch this week ? 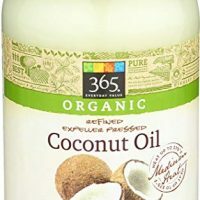 If I were to substitute coconut oil for vegan butter, how much would I need? Hi Natalie, I would use the same amount (1/2 cup) vegan butter and decrease the salt to 3/4 tsp. It may spread less than the coconut oil so I might also decrease the flour by 1 or 2 tablespoons. Depends on if you like thicker or thinner cookies. It will taste good either way! Hi Véronique, I’m not sure exactly why the cookie dough was drippy! The only thing I can think of is for some reason the tahini split? Did you follow the recipe exactly? I’ve made these several times and with at least three brands of tahini and they’ve worked out each time! Coconut oil does feel greasy at a warm room temperature, so that part isn’t surprising but that should have changed after chilling. As for spreading, was your tahini very runny? That can affect how much the cookie spreads. You can always add another tablespoon or two of flour to make a more cake-y type of cookie and lessen spreading, or use a vegan butter. Hi Eva .. I can’t wait to make these cookies, they look amazing. Have you or any of your followers tried making them with Gluten free flour or coconut flour? Hi Lois, not that I’m aware of. I would probably try them with a gluten free all purpose blend if I were to try them gluten free. If you do try it, I’d love to hear how it worked out for you! I made them with quinoa flour and they still tasted great! I’m sure it’ll be fine! I just made these cookies, but instead of coconut oil I used Earth Balance (I like the buttery flavor) and instead of nut milk I used finely shredded zucchini. I did need to cook them more around 15 minutes though, I think because of the moisture in the zucchini. They turned out great! 🙂 Thank you! Made these with black tahini and they turned out fantastic! I tried making these with earth balance and tahini the consistency of runny pb and had the same problem the other commenter had: oily dough that wouldn’t firm up despite chilling. I used coconut sugar in place of brown but in my experience that doesn’t matter. I’ll skip adding any milk next time and add flour. They tasted very good, but didn’t resemble yours at all. Hi Diane, thanks for reporting back. I agree that while coconut sugar isn’t going to have identical results to brown sugar it shouldn’t cause the dough to split. It’s possible the earth balance is the culprit. I’ll need to do some more testing with that version! I’m new to using EB (usually use coconut or avocado oils when baking) but had been having great results using it so far so I was surprised these spread so much. I think maybe they didn’t need the added milk. I have found in previous recipes that I can’t substitute coconut oil and earth balance directly for one another and have to make other tweaks to the recipe for the cookies to come out. Decreasing the liquid, or even increasing the flour or cornstarch, could help with the spreading if you want thicker cookies. Also, you didn’t specify, but if you use Earth Balance, you need to make sure to use the buttery sticks, as the tub variety has way too much water for baking. It was the sticks. I’ll try again with just coconut oil. Can I replace the all purpose flour for oat flour and the granulated sugar for monk fruit? Hi Ada, I know people have had success substituting the flour for gluten-free all purpose blends and someone commented above that they had success with quinoa flour. I’m not sure about 100% oat flour specifically, and I’ve not experimented with sugar substitutes myself so can’t speak for the monk fruit. Just wondering if there’s an option with less sugar? I haven’t tried the recipe with less sugar so can’t say for sure, but you could try it with less if you prefer.. I’d probably just cut back about 25% to see how it comes out and go from there. I don’t post comments often, but I had to this time. Boy are these good! This is now my go to chocolate chip cookie recipe! Thank you! These are my favourite cookies EVER!!! I have my 4th batch in the oven as I type 🙂 thank you! these tasted great but the inside of the cookie was a little grainy and i had to leave it in the oven for a long time. ANy idea of what possibly went wrong? Hi Julian, I’m not sure exactly as I haven’t had this exact problem. Did you follow the recipe exactly or make any changes? My guess is it would be the sugar that is a bit grainy if anything, did the sugar get fully creamed into the coconut oil in the first step? Are you using a raw sugar or a coarser ground organic sugar? If this is the case and a thorough creaming doesn’t solve the problem you can grind the sugar a bit before baking with it. Otherwise I’m not sure without more information. I love these cookies! However they have a tendency to farll apart in people’s hands. Is there’ something I can do to make the cookie more stable? Thank you! Hi Heather, I’m guessing the culprit is the temperature of the cookies, since coconut oil is solid when it’s cold and liquid at a warm room temperature, so you can try keeping the cookies in the fridge to make them firm up. If they are very thin I find them more likely to fall apart too, so if that’s the case with yours you can try adding a tablespoon or two of extra flour. Tahini varies so much from brand to brand that everyones cookies come out slightly different.